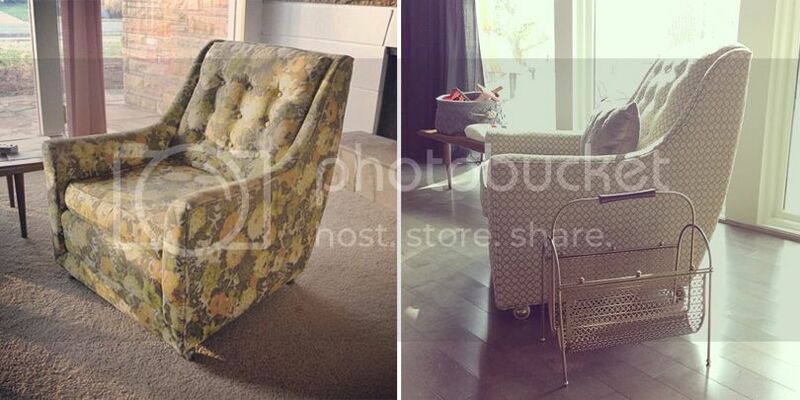 Vintage vs. new furniture - it can be a debate. New is new - no fixing, no worries. You buy it, it shows up, and it's ready to go. Vintage is old - usually needs work, but can be fabulous. You spend time tracking it down, and it might not be exactly what you were thinking - but there IS potential. There are various midcentury home design clients I'm currently working with, so I'm always out thrifting for pieces. I come across a lot of odds and ends, but finding actual pieces of furniture - especially pairs of chairs - doesn't happen everyday. I came across a pair of chairs last week which weren't the most gorgeous in their current state, but if I had a storage room dedicated to future projects, I would have purchased them for the right project for sure. They needed to be recovered, needed new legs, and I would have added some buttons to the back for some more tailored style, but they were priced right ($200 for the pair, and I was going to offer $150), and they were actually comfortable. I showed them to Greg, but he wasn't on board - pretty sure he didn't see the potential I did! 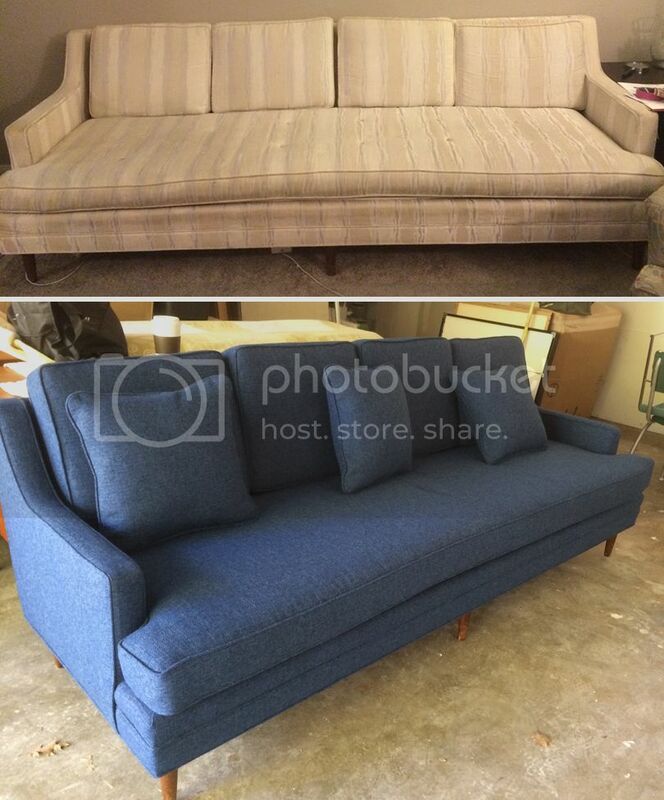 This week, David S., a fellow in Austin, Texas whom I follow on Instagram, posted a before & after of his wife's grandmother's sofa they recently had recovered. It brought me RIGHT back to the thrift store - THIS is what I'm talking about when I encourage buying secondhand. Here's the side view. The "before" image is pretty blah. Fabric looks worn and faded in spots. It's nothing too exciting. David mentioned this was NOT the original fabric, as he found a small bolt of remaining fabric tucked away. BUT - the curve of that arm is fabulous, as are the simple legs. The pair of chairs I found last week looked very similar to this, except, GASP!, there was a skirt covering the legs up! And then there's the LOVELY "after" image on the right. The color! The restuffed cushions! Those simple legs. Perfection. Obviously in the "before" image, above, the sofa looks worn out and tired. The back cushions are flat and the fabric is worn. David said he remembers sitting on this sofa 24 years ago at his wife's grandmother's home during family events. And then you have the fabulous "after" image - everything is perky and perfect once again. I personally LOVE the blue they picked for the fabric, and know this sofa has plenty of life left in it. Here's a little accent chair by Kroehler I picked up on Craig's List before we moved into this house. They were asking $125, I offered $100, and feel this is about what I want to spend on chairs that need some love. Sadly, the green floral fabric was threadbare in spots. I didn't plan on keeping it from first sight. I don't know why this is the only photo I have of the "after", but the woman who I use for upholstery projects, Jan, did an absolutely amazing job on it. The buttons line up perfectly. The welting is impeccable. It's fantastic. I even had the seat restuffed, and I still have under $300 into this little chair. The fabric was sourced at the Herman Miller outlet center in Zeeland, Michigan. I'm thinking they sold me the bolt for around $40, and I still have plenty left for another project or two. And here's a peek at the next project I personally have going on. We picked up this three season furniture on Craig's List before we bought this house too. It includes a sectional sofa, two chairs, an ottoman, and a love seat. The love seat is slightly different, but works with the set. Currently the worn and faded blue & white stripe cushions are off at Jan's shop being recovered in the chartreuse fabric you see a peek of in the right photo. 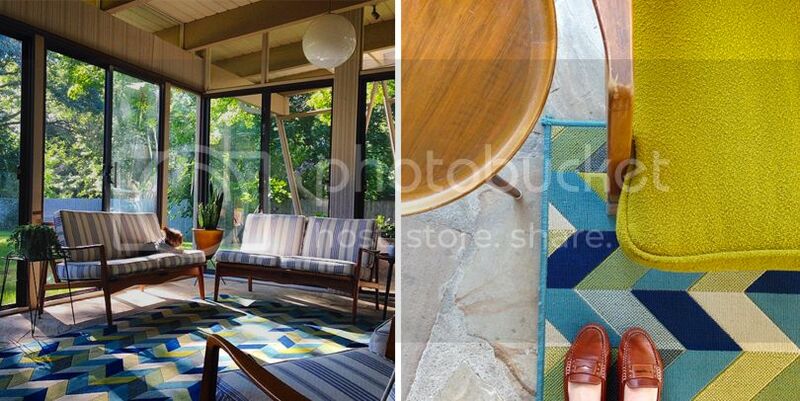 It matches our indoor/outdoor rug from Grandin Road just about perfectly. The fabulous fabric I picked up at the Herman Miller outlet for a song. I think I purchased the large bolt for under $75 and it has to be close to 15 yards of heavy duty fabric - perfect for this project! So there you have it - my "reduce, reuse, recycle" post about furniture. So many things are available with a bit of hunting. I will be sure to share a photo of my patio when it's all ready to go with the new look - I cannot wait for our grass to get green again too! Love the Kroehler Chair!! Where do you have your pieces reupholstered? I live in GH. Love the Kroehler chair!! Where do you get your pieces upholster. I live in GH. Thanks! Hi Anon, I use a woman named Jan for my pieces. She's in the Walker-area. No website or email address - she's totally old school and has a phone only. She does a wonderful job, but is always swampped, so I usually wait a long time for a piece! I love what you have done with this accent chair. In my old apartment I had chair like this. It was so old that eventually I throw it away. I am really sorry that I didn't find your blog earlier. Maybe this chair would have different destiny. Thank you!